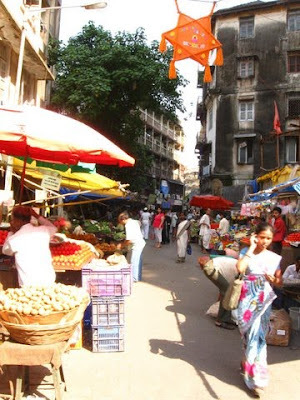 What I love most about my Masala Meanders of Mumbai, is the chance to show people around this city that I love while gabbing on endlessly about its colourful culture and fabulous food options. So when James Ransome dropped me a line via the Masala Trails website, asking if there was a tour he could join between 27-31 Dec, I just could not say no, even though we’d switched off for the holidays. I shook off the Christmas stupor that was making me lazy and I am SO GLAD I did, because it turned out to be a lovely tour with fascinating company! At first I was going to do a normal tour but when James emailed me details about himself, I reworked my plans. It turned out that James Ransome is the head Spicer-owner of The Spicery a charming extremely romantic old world sounding shop in the UK that sells spices, freshly ground seasonal spice blends, spiceboxes, Recipe kits and some interesting spicy bits and pieces such as the very clever easy reach magnetic spice rack (could I have two in blue please, thanks very much!). The spicery is inspired by an almost obsolete concept, the spicery of medieval England. The spicery was a sub office or section of the kitchen that existed alongside other offices of the kitchen, such as the saucery and the scullery in affluent households. The Spicery, overseen by a spicerer was responsible for spices measured out for use in food and medication as well as being the repository of what was then an extremely expensive commodity at the time. A tall order at the best of times, but even more difficult to fit into the time frame of 3-4 hours I had. So I decided to focus on a small introduction to Mumbai food, highlighting some of the lesser known community cuisines; Gujarati, Parsi, East Indian, Irani, over lunch at Soam, where we sampled street food and some classics of Gujarati Cuisine such as Undhiyu which along with Shrikhand and Mohanthal blew James away. And then we were off on a Spice tour of Mumbai. 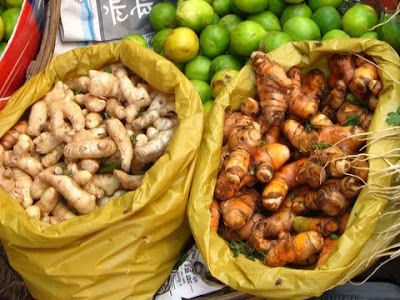 We did a quick market walk through Bhajji Galli, with a focus on fresh spices; it is the perfect time for such a tour because a lot of fresh spices are in season currently; green peppercorns, green garlic, fresh turmeric, fresh anise. Bhajji Galli, as usual was a riot of produce. I have been back every second week because on Masala Trails and I swear it has been getting greener as the winter progressed. It was hard to leave without picking up a few things but we had lots to do so I resisted temptaion for once. We headed on to Motilal Masalawall the source for all things spice, but most importantly for Parsi ingredients such as Motilals Dhansak Masala and Kolahs vinegar, the sugarcane vinegar that lends its intrinsic earthy sweet-sour flavour to Parsi Cuisine. At the end of the visit, we moved on to Mirchi gali and Achar gali at Lalbaug. As soon as we were in the car, I brought out the bag full of spices I had packed for James from my personal cache, with the objective of giving him as much information as possible. As we drove on, I gave James a rundown on each little newspaper wrapped offering; East Indian Bottle Masala I had made with a friend in Vasai, Triphal from Goa, India’s version of Sichuan Peppercorn, Limoo Omani, the dried limes that were so important to Irani cuisine, and Zaresht berries, the sour little rubies of the legendary Berry Polov. Before we could say Chilli we were at Mirchi galli. This is an area hard to miss when one drives by. Mirchi gali literally Chilli street, is perpendicular to Chivda galli and Achar Gali. Chivdas are snack time merry mixes that blend things like beaten rice, chickpea flour grits, peanuts, raisins, spices and all sorts of things. They come in a variety of blends and Chivda Gali has a dwindling number of shops that still make these. Achar means pickle and yes, you guessed it Achar Gali is where you will find pickle shops that do Maharashtrian style pickles, spice powders and spice blends. Mirchi Gali is probably the only place in urban Mumbai where you will see piles and piles of chillies as far as the eye can see. Walking through some of my favourite shops, I showed James the different chillies displayed; Wrinkled Kashmiri chillies valued for the color they imparted to Indian food, spicy Bedgi chillies and fiery Pandi chillies from Andhra. Local Sankeshwari chillies were still to come into season. 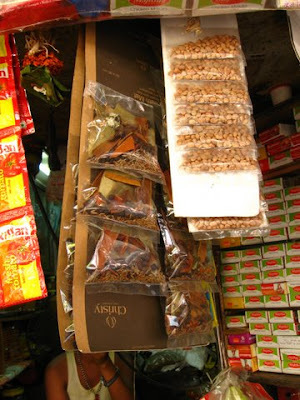 We also looked at some lesser known spices such as the Kebabchini (allspice which James said was more like Cubeb pepper – a debate for another day) and Nagkesar. We also saw the difference between Asafeotida of different levels of purity. All too soon it was time for us to part ways. I had to get home to the kids and Christmas preperations. So off we went, James suitably armed with a list of places to try out. I made James buy Dhansak Masala and Kolahs Vinegar with a promise to send him the recipe. I will be posting that next so be sure to come have a look at that as well when I do. Also just so you know we have a Masala Meanders Gujerat nu Jaman tour coming up on the 15th which is a Winter special. Winter is the season of plenty in Gujarat with fields of ripening produce stretching endlessly before one’s eyes. Everywhere there is an abundance of the freshest, sweetest, offerings and this months tour focuses on the Gujarati Winter Menu in keeping with the seasonality of the Gujerati diet, the tour focuses on Undhiyu the legendary winter special and another delicacy from Surat that graces our tables ever so briefly for a few weeks each year… Paunk… tender green Jowar (Sorghum millet). Its a one off, and there are ONLY 10 openings! Call +91 22 40418888 to book. Soam with a view of the Babulnath Temple accross the street. Mohanthal is usually set in plates and cut into diamonds. But at Soam it is served freshly made and still molten. Fresh Mango Ginger and Turmeric, which we pickle in the Gujaratis - julienne or slice in equal amounts place in a wide mouthed bottle with a few slit green chillies and salt and douse with juice of a few lemons. Ready in 2 hours and lasts weeks in the fridge. I recoment it with Green Thai Curry! A little Indian 'Spicery'. I wanted James to see this. 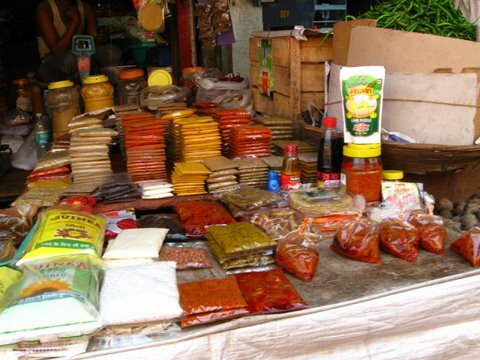 A lot of people choose to buy small amounts of spices as the need them and shops like these sell ready blends of whole spices, spice powders, pickles and chutneys. Single serve pkts of Garam Masala. Bhajji Galli in its Christmas Avatar. I love this market because it is so friendly and cosmopolitan. Chillies as far as the eye can see! Kebab Chini - Allspice or Cubeb Pepper? James gets a sniff of the Earthy Dagad Phool or stone flower a fungus that is intrinsic to Malvani Masala. Superb post...made my day just reading through this interesting write up. Lovely pics too.